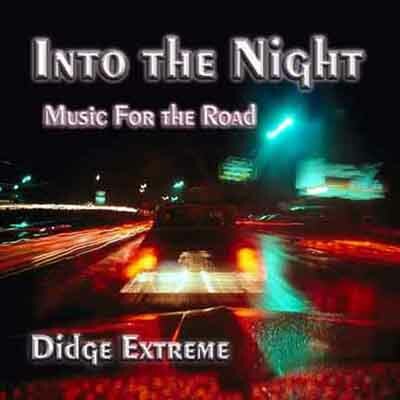 INTO THE NIGHT, Music for the Road – A vibrant blend of contemporary dance grooves mixed with the evocative voices of the didgeridoo along with exotic flutes and drums from around the world. A fantastic companion for road trips with pulsating and energetic tracks that you will find vitalizing and refreshing. Listen to short audio samples of “Into the Night” below…. All the music for “Into the Night” was produced by David Blonski at Timeless Productions Studio using a Pro Tools Mix TDM system with a Trident Series 65 analog console for tracking and monitoring. Numerous sample and loop libraries were used inthis project and many of the basic tracks were created using Acid Pro and Groove Maker Software. Didgeridoos, flutes, keyboards, wind synthesizers, electronic and acoustic percussion were all played by David Blonski. This entire project is a tribute to the many hours that I have spent behind the wheel traveling from one festival to another and most specifically it relates to my many drives across the desert to Joshua Tree, Las Vegas, Phoenix and Tucson. I have spent hundreds of hours on the road listening to these songs in their various forms as I have worked on them and I found them very effective for keeping me awake with my toes tapping on those late night drives across the desert. I have driven 10 hours straight listening to this one album without getting tired of the music so now that it is released it gets my highest recommendation for traveling music. “Into the Night” represents a new genre of music for me that I will, for the time being, call ‘Tribal House’…. a mix of dance type grooves combined with the worldly voices of didgeridoo, world percussion and exotic flutes from around the world and for the first time ever I have produced two vocal tracks… “Must be Dreaming” and “Into the Night I Roam”. I hope that you will enjoy this recording and share in my excitement.